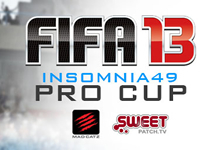 Multiplay and Sweetpatch TV are proud to welcome back the FIFA 13 Pro Cup sponsored by Mad Catz. Last year was a blast for FIFA, and we expect no different for insomnia49. After the Final on the Sunday the Final League Table for the FIFA Masters Series (#FIFAMS) will be decided and then we will host the Grand Final of the first ever #FIFAMS. The FIFA 13 Pro Cup sponsored by Mad Catz will take place across the weekend, with bonus 1v1 and 2v2 casual tournaments for players who just want to get some good games in. With a minimum prize pool of £1,000, head down for a chance to win a tidy sum playing the virtually beautiful game. Also make sure you check out the FIFA 13 (PC) WCG qualifier tournament which will take place on the Friday of the event. There will also be a 2v2 casual tournament on Saturday. On Sunday the grand finals of the FIFA Masters Series will take place, don’t miss it! Event and ticket information can be found at our insomnia49 event. Lots more FIFA 13 news for insomnia49 coming soon.